© Keller & Manni, LP. All Rights Reserved. At K+M, we apply our unique chocolate making process to single-origin cocoa beans combined with a small amount of MANNI organic extra-virgin olive oil to create a new dimension in bean-to-bar chocolate. 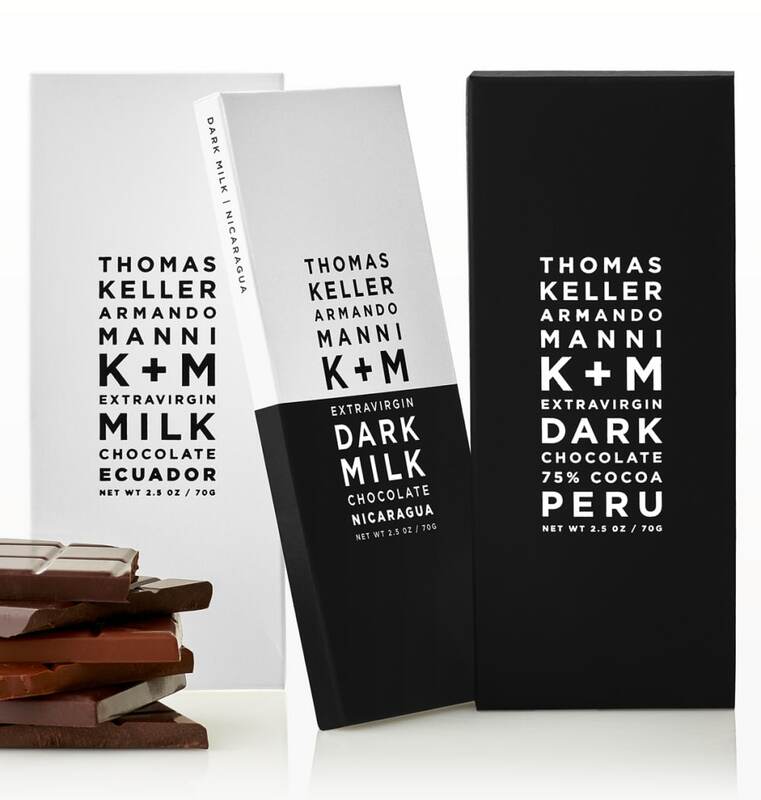 K+M Extravirgin Dark Chocolate represents the purest expression of our beans’ naturally complex flavor. K+M Extravirgin Dark Milk Chocolate perfectly balances our dark chocolate’s intensity with our milk chocolate’s creamy richness. A sublimely creamy take on classic milk chocolate, our single-origin K+M Extravirgin Milk chocolate combines sophisticated flavors with nostalgic appeal. For the ultimate gift giving experience, we have developed a beautiful four-pack gift box. We offer a focused assortment of bar combinations elegantly presented. K+M Chef’s Chocolate is used in daily production in the pastry kitchens of The French Laundry, Per Se and Bouchon Bakery for chocolate ice cream, pastry filling, mousse, custard, chocolate curls, and shavings. Available in 500 g bags of "Morceux" (6-8mm pieces) or 1 kg bars. K+M Cocoa Nibs add a delicious and intense chocolatey crunch to pastries, desserts and savory dishes alike. Available in 500 g bags. To express fully the character of each of our beans, we also offer our Chef's Chocolate in 1 kg bars across the full range of origins.